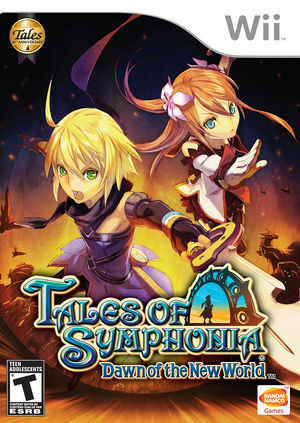 Tales of Symphonia: Dawn of the New World is a role-playing game developed by Namco Tales Studio and published by Namco Bandai for the Wii as a spin-off/sequel of Tales of Symphonia for the Nintendo GameCube. Before each triggering of a battle, the screen turns black then it cracks (correctly) and the fight starts. The problem can be corrected if Store EFB Copies to Texture Only is unchecked. Characters might not move their mouth during skits, if the Texture Cache is set to Fast. The Skits will also have a black background unless EFB Copies to Texture only is Unchecked. The graph below charts the compatibility with Tales of Symphonia: Dawn of the New World since Dolphin's 2.0 release, listing revisions only where a compatibility change occurred. 2.0 Windows XP AMD Athlon II x2 215 @ 3.45GHz NVIDIA GeForce 7025 Game completed :). All time nearly 70%-100% of speed. Some Slowdown (33-50%) at intro cutscene, last dungeon (and last cutscene), and other big places. Had to swap to r6340 for improved swing emulation (needed to kill Garuda and fishing) †.fl.l). r6340 Windows XP AMD Athlon II x2 215 @ 3.45GHz NVIDIA GeForce 7025 Game completed :), used this rev just to kill Garuda and fishing - cause it's very slow †.fl.l). This page was last edited on 16 January 2018, at 23:22.